Have you heard of the Zoo in Your Neighborhood program and our family zoo passes? Zoo in Your Neighborhood is kicking off its second year this October! It is a program designed to reach out to all members of our community. 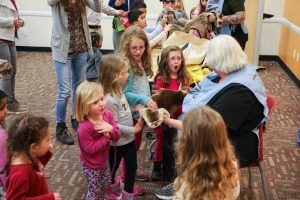 Each of these events will either feature a live animal presentation or a “Reading with the Animals” program. 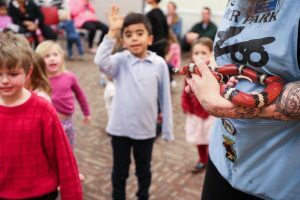 When you come to a live animal presentation you can expect to see some of our ambassador animals while learning about each one and their natural behaviors. 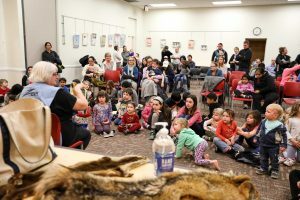 “Reading with the Animals” includes our docents reading a few animal related children’s stories and then showing some of our animal ambassadors. We offer programs at over 30 different locations and you can check our webpage to see free upcoming programs near you. Check back often, we add new locations frequently! Did you know this program distributes zoo passes around the greater Lansing area allowing families to visit the zoo free of charge? We believe everyone should be able to visit the zoo. Our zoo passes are available year round at our community partner locations . Zoo passes are like library books, you can check one out and return it within two weeks. They can even be used at Boo at the Zoo and Wonderland of Lights! Check out our website to find a list of community partners. Each community partner has a set number of passes so calling ahead to see if they are available or to be put on a waitlist is a great idea. With a zoo pass you will receive parking and admission for free. One zoo pass can be used per household. If you have any questions about our zoo passes feel free to call our community partners or email zooinyourneighborhood@ingham.org.